Kate: The Savoy is a prestigious five star hotel located in Strand (minutes from London's cosmopolitan Covent Garden) managed by the critically acclaimed Fairmont hotel chain. The Savoy hotel is without doubt one of London's most iconic hotels, with a rich history laced in luxury and a centre stage place in the elite London scene being the hosting location of the 2011 British Fashion Awards which saw the likes of A list celebrities Victoria Beckham and Kate Moss. The Savoy Hotel opened in 1889, and was Britain's first luxury hotel offering the latest innovations of the era. This included electric lighting throughout the hotel, electric lifts, bedrooms fit for royalty and constant hot and cold running water in the bedrooms. From the very beginning of the Savoy's existence quality in terms of dining and service was an integral part of how the hotel should operate, this was task was initially placed in the hands of the very capable manager Cesar Ritz (founded the Hotel Ritz in both Paris and London) and French chef Auguste Escoffier (Iconic chief). The Savoy can also modestly boast a range of famous faces that have stayed at the hotel including Bob Dylan in 1965 when filmed the video clip 'Subterranean Homesick Blues' Frank Sinatra, The Beatles, Jimi Hendrix and even Audrey Hepburn! Returning back to the present day the Savoy has recently undergone a £220 million refurbishment of the entire hotel, this includes the entrance, bars and all of the 268 bedrooms and suites. At this point I have a confession to share with you all. Ever since I was a young girl and had been on day trips to London with my parents I have dreamt of staying in a gorgeous fairytale hotel like the Savoy. Chelsie and I were both so excited (to put it lightly) to be staying at this hotel, when we heard about the full extent to the refurbishment we thought to ourselves what on Earth can this hotel be like? We eagerly counted the days down until we got the chance to find out! 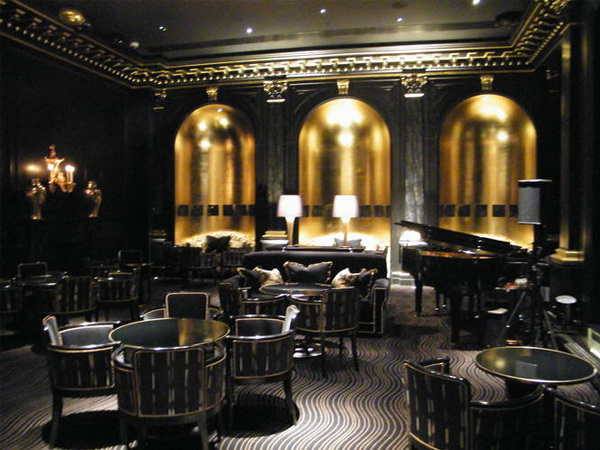 Chelsie: The Savoy is instantly recognisable as you approach the hotel with its trademark gold figure on the roof. The second we pulled into the Savoy, it was clear to see the hotel naturally oozes an unmatchable degree of class and style. We were greeted by the doorman who was dressed in a fine coat and top hat, he made us feel as if we were returning home from a trip and he tentatively took care of our luggage and showed us into the hotel. The hotel's lobby is beautiful dotted with charming bygone features alongside modern necessities. When you check into the Savoy you are treated like royalty, and feel really valued as not just a customer but rather a personal guest to the hotel. The check in process was friendly, smooth and provided us with all the information about the hotel and surrounding area we could ever need. At most hotels to have even achieved the above is fantastic, but at the Savoy they continually raise the standards for example the lady that checked us into the hotel then processed to show us to our bedroom and answer any additional questions we had. I was eagerly awaiting to see what the bedroom would look like, and was desperate to get my first peek into the room! The bedroom was gorgeous! The room looked like a show room immaculately clean blending modern features with traditional British style. Alongside a welcome note to us on the TV, on the desk a clear tray sat containing apple and tonka bean compote with shortbread (complimentary). I really liked this novelty as it gave us both a little pick up and tasted divine. The bathrooms which are en-suite follow a similar design to the main bedroom with a marble floor and both a walk in shower and bath. The Savoy also provides guests complementary basic toiletries including but not limited too cotton ear buds, toothpaste, shower caps and hand and nail cream. I personally found the bath to be blissful, it is just the right size to lay back in fill with bubbles and relax and unwind in. Every bedroom in the Savoy is equipped with the following a writing desk, armchair, personal bar, Lowe flat-screen, Vita Audio ipod docking station and Savoy furnishings. There are also slippers and bath robes in the bedrooms for guests to use to help them feel that little bit more relaxed. Kate and I ordinarily love to go and explore cities, but in the Savoys case we decided to stay in and enjoy the comforts of our bedroom, I think this is a real testimony to the quality of the Savoy hotel. Kate: Although every comfort is met in the Savoy bedrooms, the really amazing part of the bedroom undeniably is the bed itself. The bed is incredible, I have never slept in a bed that is as comfortable as the one in the Savoy. The second your head hits the pillow, your body begins to unwind and it is near on impossible to get up. The reason for this extreme comfort is the Savoy as part of its restoration and desire to provide the best experience to its guests invested heavily in only selecting the very best, with each mattresses costing £8,000 (Wow!). Without a shadow of a doubt the Savoy bedrooms are exactly where you would like to be spending the night if you are looking for a great night sleep in your trip to London. The Savoy not only met our expectations but went way beyond them. The hotel is quite frankly faultless, and one of our favourites. We really cannot recommend this hotel enough, the combination of the hotels beauty, rich history, location, caring staff and amazing bedrooms which result in a perfect night sleep make for an unforgettable experience. Chelsie and I will cherish our memories of our visit to the Savoy, and hope to return again very soon! The Savoy's Bar's: The Savoy has two main bars, both have thier own charm and unique style and both are unmissible! The Beaufort Bar: The Beaufort bar is a breathtaking extension to the hotel. The barhas a real sense of old school Hollywood glamour with dark velvet upholstered furniture, imposing gold art and heavt set walls picked out by the most ornate gold leafed rococo architraves and cornice. This bar offers guests luxurious champagne, cocktails and cabaret, Chelsie and I are yet to visit here but fingers crossed we will be sipping Champagne in here very soon! The American Bar: This bar first opened on August 6th 1889 and is one of the most defining bars within the cocktail culture and was a much needed sanctuary during the American Prohibition in the 1920/1930s. Ever since the birth of the bar, it has been destined for greatness with some of the worlds best bartenders including Harry Craddock, Peter Dorelli, Salim Khoury and Eric Lorincz working there magic to name but a few! Chelsie and I were fortunate enough to visit the American bar, and we really enjoyed our experience we sipped delicious cocktails from the wide variety on the menu and listened to the live pianist playing classic American Jazz. For those of you like Chelsie and I who are massive afternoon tea fans look no further then the Thames Foyer in the Savoy. The afternoon tea dinning area is intimate, sophisticated and relaxed with a live pianist. The afternoon tea on offer at the Savoy offers guests a wide range of teas, delicate finger sandwiches, homemade clotted cream with a range of heavenly cakes and pastries! 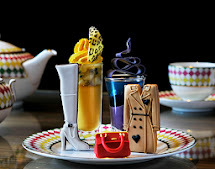 In addition to this quintessentially English afternoon tea on Sundays a brand new and highly indulgent Art Decadent Tea is on offer at the Beaufort Bar- Chelsie and I can not wait to try it! The Savoy's afternoon tea is critically acclaimed having received a 2011 Award of Excellence and also being a member of the Tea Guild. Also located in the Upper Thames Foyer is The Savoy tea shop with is a bijou tea store. The tea shop is a real visual treat and not to be missed! The store sells a wide range of products that are perfect gifts for friends and family or even as a treat for you. The products range from beautifully packages Savoy teas, tea accessories, the Savoy's very own china tea service, delicious handmade jams, biscuits, fresh patisseries and chocolates. The store also offers the guests the opportunity to see the hotel's pastry chefs and chocolatiers at work as they put the finishing touches to the mouth-watering cakes and confectionery. When Chelsie and I visited this store we simply could not leave without picking up one of the Savoy Cocktail books. The book contains 750 must try recipes from legendary bartender Harry Craddock. The Savoy's guest services include a business service center, which is in operation 24 hours a day. The business centre can be located on the second floor of the Savoy, and access is granted via your guest room key. The business centre has 3 Mac computer stations, equipt with high speed internet access, standard microsoft applications, black and white colour printing, CD burning, DVD player, FEXCO business VAT refunding services and guests are also able to connect thier personal laptops to the hotels printer, scanner and copier alongside taking advantage of the high speed internet access. On the third floor of the Savoy you will find the Beauty and Fitness centre where numerous treatment and therapies are avaliable. The health club offers the following facilities; electronic cardiovascular equipment with individual flat screen TV monitors, free weights and varaible resitance machines, personal training programmes (avaliable on request), men's and women's changing rooms with showers, lockers, men's and women's steam rooms and saunas as well as lounge areas. The swimming pool at the Savoy lies directly beneath the central atrium meaning natural daylight streams onto the pool below, if you are keen to experience this but like Kate not a strong swimmer swimming tuition is available on request. Monday to Friday: 6.30 a.m. to 9.00 p.m.
Saturday and Sunday: 8.00 a.m. to 8.00 p.m.
HAVE YOU HEARD? : The Savoy has long had an ethos of ‘personal service naturally’ and was the first hotel to establish its own school to train hotel professionals. The Savoy has reintroduced the 'Savoy Academy' which has trained a new generation of butlers who combine the discretion of a traditional English butler with the efficiency of a 21st century personal assistant. This butler service is available to all guests staying in suites. LOOKING FOR? : If you are looking for a glorious London wedding then the Savoy might just be your dream location! The Savoy as we can personally testify is one of the most beautiful hotels we have ever seen and we believe would be simply lovely for a small ceremony surrounded by close friends or perhaps even a large reception. The Savoy's team help to ensure your dream day goes exactly to plan, and even includes the hotels inhouse florists, who are on hand to advise and help plan every aspect of your special day down to the last special detail. All of the 3 Banqueting Rooms and 6 smaller Private Rooms hold wedding licences and the Savoy is fully equipped to cater for kosher celebrations.